Philadelphia Eagles safety Malcolm Jenkins during the second half against the Buccaneers. 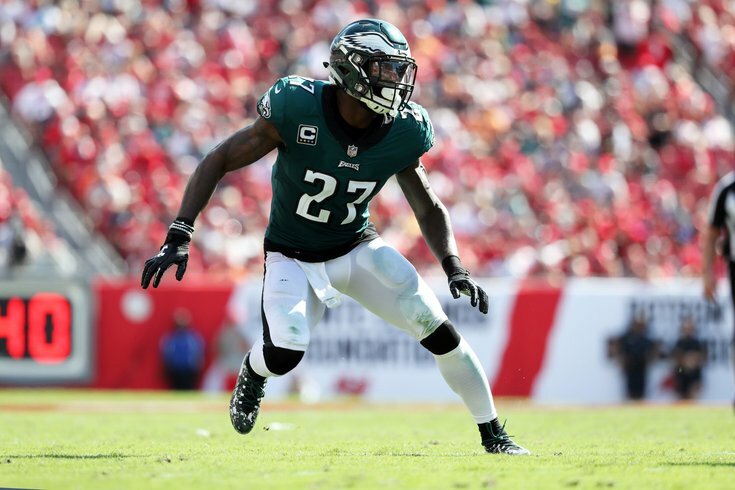 Malcolm Jenkins is a two-time Super Bowl champion and veteran NFL safety. Each week this season he'll sit down with PhillyVoice's Joe Santoliquito to bring you Safety Blitz. Malcolm Jenkins is a realist. The Eagles’ Pro Bowl safety rarely sugar-coats things — win or lose. So, as you can imagine, he was in no mood to throw hyperbole at the Eagles’ disappointing 27-21 loss to the Tampa Bay Buccaneers on Sunday. What they're saying: How much should we expect from Wentz? In fact, Jenkins, as is typical, was blunt about what happened. “The first thing we learned is that we’re not good enough to make the bad mistakes that we made and still win,” said Jenkins, who caused a major fumble with 12:30 left to play and the Eagles down, 27-14. “I think we again learned and continue to believe that we can win in any situation. On the first play of the game, Bucs’ quarterback Ryan Fitzpatrick hit former Eagle DeSean Jackson in stride for a 75-yard touchdown. It was the longest touchdown play to open a game in Bucs’ history. “I think everybody in the world knew that they were going to take a play-action shot deep to D-Jax, including me, and still I bit on an intermediate route as opposed to the deep ball,” Jenkins said. “That’s just on me. Other than that, I didn’t feel I had a good chance to impact the game until the force fumble [in the fourth quarter], just because of where I was playing and what they were giving us. What Jenkins had a concern about entering the Tampa game was the “chunk plays,” the ones that eat up a big chunk of yardage. “The chunk plays we gave up against Atlanta, none of them went for touchdowns,” Jenkins said. “If you’re giving up chunk plays underneath the defense, at the end of the day, we can live with that. The five chunk plays we had against Atlanta I don’t think were very impactful on the game. The two big ones Tampa Bay had, one right in front of me, which won’t happen again, we just have to make plays. We don’t have a Super Bowl hangover... We just made bad mistakes. That one loss doesn’t change who we are and where we’re going. Up next are the Indianapolis Colts and the seemingly resurgent Andrew Luck, coached by former Eagles’ offensive coordinator Frank Reich, this Sunday at Lincoln Financial Field at 1 p.m.
“T.Y. Hilton definitely presents a problem and Andrew Luck is the kind of quarterback who’s smart, and is mobile when he wants to be,” Jenkins said. “We have to be able to affect Luck and keep T.Y. in front of us. Frank Reich knows us, we know him, but we’re not that complicated on defense. “Everyone knows what we like to do. We’re not worried about that. We know them, they know us, and so it’s a wash there. It’s a matter of execution and players on the field. We need to execute. We didn’t execute against Tampa, and we need to do that. It’s that simple. We don’t have a tackling problem. We missed one tackle [on the O.J. Howard second-quarter 75-yard TD catch]. Now suddenly, everyone assumes we have an issue tackling. We don’t. I don’t think we have to spend a whole day doing tackling drills. Follow Malcolm Jenkins on Twitter @MalcolmJenkins and Facebook at MalcolmJenkinsNFL. Visit Malcolm's clothing store, Damari Savile: Born in the City of Brotherly Love, Damari Savile provides made to order suiting for those looking for a more stylish fit for their wardrobe. Located at 709 Walnut Street.